The WWE Raw guest star is a concept which involves a current or former WWE performer, mainstream celebrity or, sports personality making a guest appearance, assuming the on-screen role as a guest star for that particular episode. The guest star also often participates in backstage vignettes with members of the WWE roster. The concept was introduced on the June 15, 2009 episode of WWE Raw by Donald Trump, who at the time was involved in an angle where he was the owner of the Raw franchise. On June 22, after having regained ownership of Raw, WWE Chairman Vince McMahon announced that Trump's initiative would go into effect on June 29, with the first star being Batista. For almost a year, Raw featured a guest star each week except for the week of April 26, 2010 episode, which featured the 2010 WWE Draft. As of June 14, 2010, WWE decided to slowly phase out the guest star concept on Raw, by only scheduling guest stars every other week, with the possibility of having a guest star only when needed. Guest hosts differ from guest stars in that they have power of a Raw brand General Manager. On May 10, 2010 it was announced that all future guest stars would no longer have that power in a decision made by the Raw general manager Vickie Guerrero who later quit the role that night. The guest host position was renamed to guest star, and the general manager position returned. In November 2014, the guest host position returned after a 3-year hiatus. Since the WWE Raw guest star concept was established there have been 73 episodes which have featured 92 stars. Bob Barker as Raw guest host. His stint earned him the Guest Host of the Year award at the 2009 Slammy Awards . Pee-wee Herman (Paul Reubens), who won the Guest Star Shining Moment of the Year award at the 2010 Slammy Awards. Snooki, whose stint led to a match at WrestleMania XXVII (which she won), and the A-Lister of the Year award at the 2011 Slammy Awards. "Special Guest Stars". World Wrestling Entertainment. Retrieved 2009-12-07. "Upcoming Raw Guest Stars". World Wrestling Entertainment. Retrieved 2009-12-23. ^ a b Sitterson, Aubrey (2009-06-29). "The Animal's kingdom". World Wrestling Entertainment. Retrieved 2009-07-14. ^ a b McNichol, Rob (2009-07-01). "Raw needs new MVPs". The Sun. Retrieved 2009-12-16. ^ a b Golden, Hunter (2009-06-30). "Raw Results – 6/29/09". WrestleView. Retrieved 2009-12-16. ^ Caldwell, James (2010-05-10). "WWE News: Raw results – New GM hired, then quits; guest hosts stripped of power". Pro Wrestling Torch. Retrieved 2010-06-04. ^ "Million Dollar night in Cali". Sky Sports. 2009-07-09. Retrieved 2009-12-15. ^ Golden, Hunter (2009-07-07). "Raw Results – 7/6/09". WrestleView. Retrieved 2009-12-26. ^ MacIntyre, April (2009-07-14). "Seth Green hosts WWE Raw Video". Monsters and Critics. Retrieved 2009-12-16. ^ Golden, Hunter (2009-07-14). "Raw Results – 7/13/09". WrestleView. Retrieved 2009-12-16. ^ Plummer, Dale (2009-07-20). "Raw: This show has legs, and it knows how to use them". Slam Canoe. Retrieved 2009-12-16. ^ McNichol, Rob (2009-07-22). "XZZ are not the Tops on Raw". The Sun. Retrieved 2009-12-24. ^ Skeets, J.E. (2009-07-28). "Shaquille O'Neal hosts 'Monday Night Raw,' gets physical". Yahoo!. Retrieved 2009-12-16. ^ Golden, Hunter (2009-07-28). "Raw Results – 7/27/09". WrestleView. Retrieved 2009-12-16. ^ McNichol, Rob (2009-08-05). "Entourage star Jeremy Piven fails to strike Gold". The Sun. Retrieved 2009-12-16. ^ Golden, Hunter (2009-08-04). "Raw Results – 8/3/09". WrestleView. Retrieved 2009-12-16. ^ Golden, Hunter (August 11, 2009). "Raw Results – 8/10/09". WrestleView. Retrieved December 16, 2009. ^ Baines, Tim (2009-08-15). "Sarge takes aim at Canada". Edmonton Sun. Retrieved 2009-12-16. ^ "Raw gets itself new Prize". The Sun. 2009-08-18. Retrieved 2009-12-16. ^ "Orton & Cena stun champs". Sky Sports. 2009-08-19. Retrieved 2009-12-24. ^ "Mayweather to 'host' WWE 'Raw'". ESPN. 2009-08-24. Retrieved 2009-12-24. ^ McNichol, Rob (2009-08-26). "DX shine on lacklustre Raw". The Sun. Retrieved 2009-12-24. ^ McNichol, Rob (2009-09-02). "Dusty shines on Raw". The Sun. Retrieved 2009-12-24. ^ Coyle, James (2009-09-01). "The Viper strikes again". Sky Sports. Retrieved 2009-12-24. ^ "Raw's price is right for Barker". The Miami Herald. 2009-09-05. Archived from the original on 2012-10-02. Retrieved 2009-12-24. ^ McKay, Hollie (2009-09-10). "Exclusive: Jennifer Aniston Taking Break From Acting". Fox News Channel. Retrieved 2009-12-24. Bob Barker making his return to TV by guest hosting WWE Monday Night RAW from the Allstate Arena in Chicago in support of his book "Priceless Memories." ^ Baines, Tim (2009-12-05). "Raw gets it right". Calgary Sun. Retrieved 2009-12-24. ^ Coyle, James (2009-09-15). "The Animal gets his revenge". Sky Sports. Retrieved 2009-12-24. ^ McNichol, Rob (2009-07-22). "Garcia' farewell can't save Raw". The Sun. Retrieved 2009-12-24. ^ Coyle, James (2009-09-22). "Lightning strikes on Raw". Sky Sports. Retrieved 2009-12-24. ^ Mushnick, Phil (2009-09-28). "WWE preys with Rev. Al". New York Post. Retrieved 2009-12-24. ^ Coyle, James (2009-09-30). "Cena on top of the world". Sky Sports. Retrieved 2009-12-24. ^ Coyle, James (2009-10-06). "DX take down Jerishow". Sky Sports. Retrieved 2009-12-24. ^ McNichol, Ron (2009-10-13). "WWE Raw is in need of a huge shake-up after very poor show". The Sun. Retrieved 2009-12-24. ^ Coyle, James (2009-10-13). "Viper left stunned". Sky Sports. Retrieved 2009-10-24. ^ Reid, Shaheem (2009-10-19). "Snoop Dogg Hosts 'WWE Raw': 'I'm A Big Fan Of Wrestling'". MTV. Retrieved 2009-12-24. ^ Golden, Hunter (2009-10-19). "Raw Results – 10/19/09". WrestleView. Retrieved 2009-10-24. ^ Coyle, James (2009-10-27). "Raw retribution". Sky Sports. Retrieved 2009-12-24. ^ Plummer, Dale. "RAW: Superstars take revenge on Big Show". Slam! Wrestling. Retrieved 2009-12-24. ^ "Jerishow punish Cena on RAW". Sky Sports. 2009-12-03. Retrieved 2009-12-24. ^ White, Jim (2009-11-10). "Ricky Hatton packs punch as wrestling ringmaster". The Daily Telegraph. London. ^ Coyle, James (2009-11-10). "Hitman takes centre stage". Sky Sports. Retrieved 2009-12-24. ^ Writer X. "Raw: Smaller set, big three-way tag match at MSG". Slam! Wrestling. ^ Golden, Hunter (2009-11-17). "Raw Results – 11/16/09". WrestleView. Retrieved 2009-12-24. ^ "Jesse Ventura Hosts Three-Hour Monday Night Raw". World Wrestling Entertainment. 2009-12-16. Retrieved 2009-12-24. ^ McNichol, Rob (2009-11-25). "Sheamus set for WWE big time". The Sun. ...thanks to guest host Jesse Ventura... Retrieved 2009-12-24. ^ Hoppes, Lynn (2009-12-01). "Verne 'Mini-Me' Troyer plays major role". ESPN. Retrieved 2009-12-16. ^ Caldwell, James (2009-11-30). "Caldwelll's WWE Raw Report 11/30: Ongoing "virtual time" coverage of live Raw on USA Network". Retrieved 2009-12-16. ^ Coyle, James (2009-12-08). "Sheamus demands respect". Sky Sports. Retrieved 2009-12-24. ^ "Every NBA ref's dream comes true: Mark Cuban gets put through a table on WWE Monday Night Raw". Los Angeles Times. 2009-12-07. Retrieved 2009-12-07. ^ Plummer, Dale (2009-12-14). "Raw: Dennis Miller, Slammys can't save three-hour show". Slam Canoe. Retrieved December 16, 2009. ^ "Dennis Miller to Host WWE Slammy Awards". World Wrestling Entertainment. 2009-11-06. Retrieved 2009-12-24. ^ Golden, Hunter (2009-12-21). "Raw Results – 12/21/09". WrestleView. Retrieved 2009-12-24. ^ Gonzalez, Alden (2009-12-22). "Damon takes to the ring to host 'Raw'". MLB. Retrieved 2009-12-24. ^ Adkins, Greg (2009-12-28). "Timbaland shocks the house". World Wrestling Entertainment. Retrieved 2009-12-29. ^ Keller, Wade (2009-12-29). "Keller's WWE Raw Report 12/28: Sheamus defends against Cena, McMahon announces Bret Hart returns next week". PWTorch. Retrieved 2009-12-29. ^ McNichol, Rob (2010-01-05). "Hart and Vince give Raw a kick". The Sun. Retrieved 2010-01-05. ^ McCoy, Heath (2010-01-11). "Canadian pro-wrestling icon Bret 'The Hitman' Hart returns to WWE after 12 years". The Vancouver Sun. Archived from the original on January 15, 2010. Retrieved 2010-01-12. ^ Plummer, Dale (2010-01-12). "Raw: Iron Mike and DX reunite". Slam Canoe. Retrieved 2010-01-12. ^ "Mike Tyson to host WWE Raw". The Miami Herald. 2010-01-09. Retrieved 2010-01-12. ^ Plummer, Dale (2010-01-18). "Raw: Who isn't in the Royal Rumble?". Slam Canoe. Retrieved 2010-01-26. ^ Keller, Wade (2010-01-18). "Keller's WWE Raw Report 1/18: The march to the Royal Rumble continues, plus Vince McMahon-Bret Hart follow-up, Undertaker visits Raw". PWTorch. Retrieved 2010-01-26. ^ Plummer, Dale (2010-01-25). "Raw: Getting "Psych"-ed for the Rumble". Slam Canoe. Retrieved 2010-01-26. ^ Keller, Wade (2010-01-25). "Keller's WWE Raw Report 1/25: Final Royal Rumble hype, Michaels & Hunter vs. Rhodes & DiBiase, MVP vs. Miz". PWTorch. Retrieved 2010-01-26. ^ McNichol, Rob (2010-02-02). "It's a long and winding road to WrestleMania after WWE Raw". The Sun. Retrieved 2010-02-03. ^ Plummer, Dale (2010-02-01). "Raw: Boldly going into the Elimination Chamber". Slam Canoe. Retrieved 2010-02-03. ^ Long, Mark (2010-02-12). "Daytona 500 favorite? It's anyone's guess". USA Today. Retrieved 2010-03-03. ^ Adkins, Greg (2010-02-08). "Raw's pit stomp". World Wrestling Entertainment. Retrieved 2010-03-03. ^ Greene, Jerry (2010-02-15). "Jerry Springer to host WWE: Raw on Monday". ESPN. Retrieved 2010-03-03. ^ Martin, Lara (2010-02-15). "US TV Interview – Jerry Springer, The Miz ('WWE Raw')". Digital Spy. Retrieved 2010-03-03. ^ Smith, Hazel (2010-02-01). "HOT DISH: Jewel Wrestles With WWE Hosting Duties". Country Music Television. Retrieved 2010-03-03. ^ Plummer, Dale (2010-02-22). "Raw: Finding a Jewel on the Road to Wrestlemania". Slam Canoe. Retrieved 2010-03-03. ^ McNichol, Rob (2010-03-02). "Raw, what is it good for?". The Sun. Retrieved 2010-03-03. ^ Caldwell, James (2010-03-08). "Caldwell's WWE Raw Report 3/8: Complete coverage of Cena vs. McMahon, Taker-Michaels confrontation". PWTorch. Retrieved 2010-03-10. ^ Leach, Robin (2010-03-09). "Criss Angel makes magic at WWE's Raw in Portland". Las Vegas Sun. Retrieved 2010-03-10. ^ Bishop, Matt (2010-03-15). "Raw: Austin, Hart have surprise for McMahon". Slam Canoe. Retrieved 2010-03-22. ^ Coyle, James (2010-03-16). "Cast off". Sky Sports. Retrieved 2010-03-22. ^ Plumber, Dale (2010-03-22). "Raw: Rose leads a hit show". Slam Canoe. Retrieved 2010-04-15. ^ McNichol, Rob (2010-03-16). "WWE's build-up to the big one". The Sun. Retrieved 2010-04-15. ^ Plumber, Dale (2010-03-29). "Raw: HBK says farewell to the WWE Universe". Slam Canoe. Retrieved 2010-04-15. ^ Barshad, Amos (2010-04-01). "Hot Tub Time Machine's Rob Corddry on Specializing in Aggressive Jerks". New York. Retrieved 2010-04-15. ^ Coyle, James (2010-04-06). "Otunga betrays Cena". Sky Sports. Retrieved 2010-04-15. ^ Anderson, Kyle (2010-04-06). "Jennifer Hudson And David Otunga Each Have 'One Shining Moment'". MTV. Retrieved 2010-04-15. ^ Caldwell, James (2010-04-13). "Caldwell's WWE Raw Report 4/12: Batista vs. Orton, Miz and Bret Hart, 1990s pop culture, The Basics well-covered". Pro Wrestling Torch. Retrieved 2010-04-15. ^ Plumber, Dale (2010-04-12). "Raw: Don't Hassel the Hoff". Slam Canoe. Retrieved 2010-04-15. ^ Gardner, James (2010-04-20). "MacGruber to the Rescue for Ash Kicked WWE". NBC New York. Retrieved 2010-05-10. ^ a b Steinberg, Jacques (2010-05-09). "Celebrity Guest Hosts Find Fans, and Some Fun, in 'Raw's' Ring". The New York Times. Retrieved 2010-05-10. ^ Coyle, James (2010-05-07). "Bitter rivals set to clash". Sky Sports. Retrieved 2010-05-10. ^ Plumber, Dale (2010-05-03). "Raw: A very Brady Monday Nigh". Slam Canoe. Retrieved 2010-05-10. ^ Anderson, Kyle (2010-05-11). "Flavor Flav, Meat Loaf Team Up For 'WWE Raw'". MTV. Retrieved 2010-05-13. ^ McNichol, Rob (2010-05-12). "Randy shows he can use his Loaf". The Sun. Retrieved 2010-05-13. ^ Coyle, James (2010-05-18). "Animal Batista roars". Sky Sports. Retrieved 2010-06-04. ^ Plummer, Dale (2010-05-24). "Raw: New GM has Hart; Batista quits". Slam Canoe. Retrieved 2010-06-04. ^ Coyle, James (2010-05-24). "Cena makes Batista pay". Sky Sports. Retrieved 2010-06-04. ^ McNichol, Rob (2010-06-02). "Bourne find his star identity". The Sun. Retrieved 2010-06-04. ^ Eck, Kevin (2010-06-01). "One giant leap for Evan 'Air' Bourne on Raw". The Baltimore Sun. Retrieved 2010-06-04. ^ Coyle, james (2010-06-02). "Bourne supremacy on RAW". Sky Sports. Retrieved 2010-06-04. ^ McNichol, Rob (2010-06-08). "NXT stars top WWE's A-Team". The Sun. Retrieved 2010-06-12. ^ MacIntyre, April (2010-06-12). "'Royal Pains' Mark Feuerstein and Big Show on WWE RAW, ask them questions!". Monsters and Critics. Retrieved 2010-06-16. ^ Caldwell, James (2010-06-03). "WWE News: New Raw guest host announced for final Raw in June". Pro Wrestling Torch. Retrieved 2010-06-03. ^ "Upcoming Raw guest hosts". ^ a b c d e f "Upcoming Raw guest hosts". WWE. 2010-08-12. Retrieved 2010-08-12. ^ "SNOOKI IS RAW". Archived from the original on 2012-02-19. ^ "Raw: Mya and the WWE Universe sing "Happy Birthday" to the Rock". ^ "The Rock celebrates his birthday on Raw". ^ "Hugh Jackman to star on Sept. 19 WWE Raw SuperShow". WWE. 2011-09-05. Retrieved 2011-09-05. ^ "The Muppets come to Raw on Halloween night". WWE. 2011-09-19. Retrieved 2011-09-19. ^ "Perez Hilton on tonight's Raw SuperShow". WWE. 2014-03-18. Retrieved 2012-01-16. ^ "Hot Stoogery: The 3 Stooges Take On WWE". Deadline. 2014-03-18. Retrieved 2010-04-10. ^ "Michael Strahan to guest star on Nov. 25 edition of Monday Night Raw". WWE. 2014-03-18. Retrieved 2013-11-18. ^ "Betty White to guest star on tonight's Raw". WWE. 2014-03-18. Retrieved 2014-02-10. ^ "Aaron Paul hosts 'WWE Monday Night Raw,' and it is as glorious as you'd expect". Entertainment Weekly. 2014-03-18. Retrieved 2014-03-04. ^ "Arnold Schwarzenegger and Joe Manganiello to guest star on Monday's Raw". WWE. 2014-03-18. Retrieved 2014-03-17. ^ "Grumpy Cat to Host WWE's Monday Night Raw". People. 2014-11-10. Retrieved 2014-11-17. ^ "Video: LaVar Ball takes off his shirt on WWE Raw". Retrieved 6 September 2018. 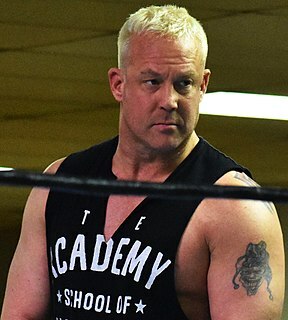 Charles Doyle Haas II is an American retired professional and amateur wrestler. He is best known for his appearances with World Wrestling Entertainment (WWE) in the 2000s and Ring of Honor (ROH) in the 2010s. He is also known for teaming up with Shelton Benjamin and Kurt Angle in a tag team called "The World's Greatest Tag Team"
Shelton Benjamin is an American professional wrestler currently signed to WWE on the SmackDown brand. He is also known for his work in New Japan Pro-Wrestling (NJPW) and Pro Wrestling Noah through their working relationship under the ring name Shelton X Benjamin and for American promotion Ring of Honor (ROH) under his real name. Prior to becoming a professional wrestler, he was a two-sport athlete in college. Benjamin won an NJCAA championship in both track and field and collegiate wrestling. After attending junior college, he completed his degree from the University of Minnesota. The WWE Championship is a professional wrestling world heavyweight championship in WWE, currently on the SmackDown brand. It is the first world title established in WWE, having been introduced in 1963 as the World Wide Wrestling Federation (WWWF) World Heavyweight Championship. The promotion was renamed World Wrestling Federation (WWF) in 1979 and ended its affiliation with the National Wrestling Alliance (NWA) in 1983, with the title also renamed to reflect the changes. In 2001, it was unified with the World Championship following the WWF's buyout of World Championship Wrestling (WCW) and became the Undisputed WWF Championship. In 2002, the WWF was renamed World Wrestling Entertainment (WWE) and split its roster into two brands, Raw and SmackDown. The title, now renamed WWE Championship, was then designated to the SmackDown brand while WWE established an alternate world title known as the World Heavyweight Championship for the Raw brand. A third alternate world title, the ECW World Heavyweight Championship, was reactivated for the ECW brand in 2006. It was vacated and decommissioned when the ECW brand disbanded in 2010. The WWE Intercontinental Championship is a professional wrestling championship contested in and owned by the American promotion WWE on the SmackDown brand. The title was introduced into the World Wrestling Federation in 1979. Pat Patterson, holder of the WWF North American Heavyweight Championship, was awarded the title. The WWE United States Championship is a professional wrestling championship contested in the American promotion WWE on the Raw brand. It was originally known as the NWA United States Heavyweight Championship and began as a regional championship created by and defended in Mid-Atlantic Championship Wrestling, run by Jim Crockett Jr. Harley Race became the inaugural champion on the title's introduction on January 1, 1975. Turner Broadcasting bought the company in November 1988 and renamed it World Championship Wrestling (WCW) after its primary television program. The World's Greatest Tag Team was a professional wrestling tag team, which also used the name Wrestling's Greatest Tag Team. The team consisted of Charlie Haas and Shelton Benjamin. Originally formed in World Wrestling Entertainment (WWE), they started out captained by Kurt Angle, during which time they were known as Team Angle. They also wrestled for several other independent promotions. Harry Francis Smith is a Canadian professional wrestler who is currently working for New Japan Pro-Wrestling and Major League Wrestling as Davey Boy Smith Jr., regularly teaming with Lance Archer as the Killer Elite Squad (K.E.S.). The two are former three-time IWGP Tag Team Champions, two-time GHC Tag Team Champions and two-time NWA World Tag Team Champions. He is also appearing for World of Sport Wrestling using the name British Bulldog Jr..
Rami Sebei is a Canadian professional wrestler. 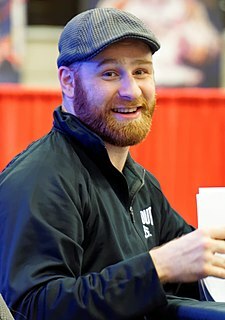 He is currently signed to WWE, where he performs on the Raw brand under the ring name Sami Zayn. Theodore James Wilson is a Canadian retired professional wrestler currently signed to WWE as a producer under the ring name Tyson Kidd. He has not wrestled since suffering a spinal cord injury during a match on June 1, 2015. The New Breed was a heel professional wrestling stable that appeared on the ECW brand of World Wrestling Entertainment (WWE) in 2007. It was originally composed of Elijah Burke and Marcus Cor Von. Matt Striker, Kevin Thorn, and Ariel first joined the stable in February 2007, then CM Punk briefly joined the stable in April 2007. WWE 2K Games is a series of professional wrestling video games based on the American professional wrestling promotion WWE. The series was first published by THQ until 2013, when Take-Two Interactive's 2K Sports took over. Games in the series are primarily developed by the Japanese based company, Yuke's. The series was published by Yuke's and known as Exciting Pro Wrestling in Japan until 2005. Following SmackDown vs. Raw 2007, THQ took over as the Japanese publisher and the series adopted the western name. Initially, the series was exclusive to PlayStation video game consoles, and was featured in all of the seventh generation consoles by 2008. The SmackDown! series is among the best-selling video game franchises with 47 million copies shipped as of 2009. The game engine for the series is based on that used by the Japanese professional wrestling video game series, Toukon Retsuden and Rumble Roses, a fictional professional wrestling series, both developed by Yuke's. THQ and Yuke's Future Media Creators consider one reason the series has remained so popular is due to series bringing "WWE programming to life through a host of key new features, extensive rosters with WWE's most popular Superstars, incredible graphics and engaging action in and beyond the ring." WrestleMania XXVII was the 27th annual WrestleMania professional wrestling pay-per-view (PPV) event produced by World Wrestling Entertainment (WWE). It took place on April 3, 2011 at the Georgia Dome in Atlanta, Georgia. The event was the first WrestleMania in the state of Georgia and the second to be held in Southeastern United States, following WrestleMania XXIV.